CPR rescued Pearl on her last day at animal services. After rescuing a pug there and seeing this beautiful face, we could not let her be put to sleep. Animal services missed that Pearl had a completely dislocated femur and previously fractured hip. 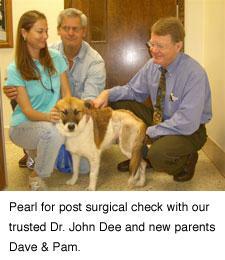 Pearl required orthopedic surgery to give her the quality of life she so deserves. Many thanks to her new wonderful forever family, Pam and David for nursing her back to heath and giving her the home of her dreams. It’s been 4 weeks since Pearl’s surgery and she’s walking fine all all 4 legs, but, still hops on 3 legs when she’s in a hurry.. The muscle tone is improving on the leg that was operated on, too. And maybe she’s put on another pound but looks really healthy. Everyday that passes she seems more comfortable and trusting of us. She is also more interested in play and her toys, too. My husband said today “we’ve bonded”. I’m so glad she’s healthy of our family. Thank You CPR for bringing us together.